Ice Chips prevents tooth decay. We have two kinds, Cherry Candy and Peppermint. Tart and tangy Sour Cherry Ice Chips our newest flavor is bound to make you pucker with delight. 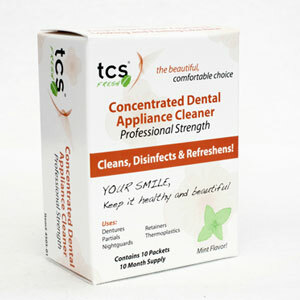 TCS Cleaner safely and effectively removes coffee, tea, tobacco, fruit and iron stains, tartar, plaque, calcium and calculus. Safe for cleaning: Dentures, Partials, Orthodontics, Nightguards, Retainers, Thermoplastics and more. Sodium fluoride makes teeth more resistant to decay and bacteria that cause cavities. This medication is used to prevent cavities. 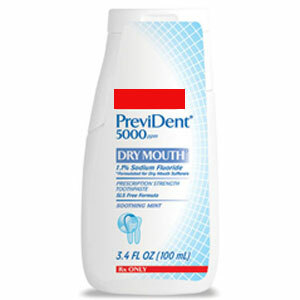 How to use PreviDent Dry Mouth? 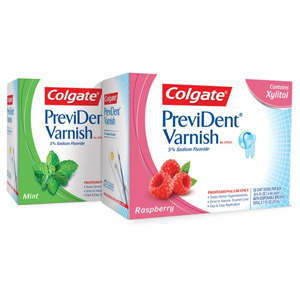 This is best used once daily just before bedtime instead of your regular toothpaste or as directed by your healthcare professional. Apply a thin ribbon of medicine to a toothbrush and brush thoroughly for 2 minutes or as directed. Enamelon® can be used daily to help prevent and treat sensitivity. 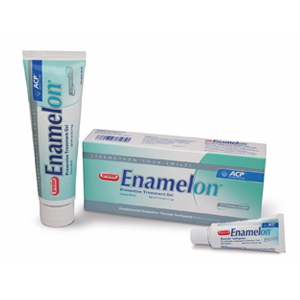 The ingredients in Enamelon® uniquely build increasing protection against tooth sensitivity. 0.45% Stannous Fluoride (1150 ppm F) Clinically Proven Active Ingredient For Anticavity, Antigingivitis and Sensitive Teeth Ultramulsion is a patented saliva-soluble coating that moisturizes and soothes soft tissues of the mouth. Mint Breeze flavor enhanced with spilanthes, a natural herb which can boost saliva flow and flavor No Sodium Lauryl Sulfate (SLS), No Gluten, No Dyes. Cleaner, fresher dentures with one daily overnight cleanser. 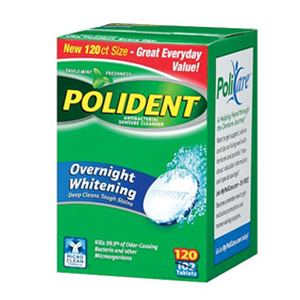 Polident® Overnight whitening kills 99.99% of more odor-causing bacteria, helps remove plaque buildup, and helps remove stains while maintaining the original color of your dentures. Unlike toothpaste, Polident® Overnight Whitening has a non-abrasive formula, so it cleans without scratching and leaves fewer places for unwanted bacteria and other microorganisms to grow. Deep cleans to help restore dentures to their original color. Kills more bacteria than toothpaste. Polident for Partials Antibacterial Denture Cleanser Tablets 40 count kills 99.9 percent of odor-causing bacteria and help reduce plaque. A clean partial reduces the risk of gum irritation, helping to protect remaining natural teeth as part of a good oral care routine. 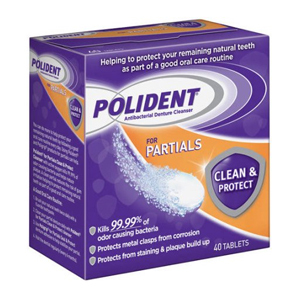 Polident for Partials Antibacterial Denture Cleanser Tablets are an essential element of a good oral cleansing routine, as the metal clasps of your partial are in danger of corroding over time from the acids of food and the oral environment, as well as the wear and tear of use. Now you can protect them from corrosion, which ensures they will be in optimal condition for longer. Each case contains five delicious flavors - 2 x fruit salad, 2 x lemon, 2 x mint, 2 x orange and 2 x raspberry. GC Dry Mouth Gel can be applied easily express a generous amount of GC Dry Mouth Gel from the tube onto a clean finger or tongue. Smear the gel over the buccal and lingual surfaces of teeth and oral mucosal tissues. 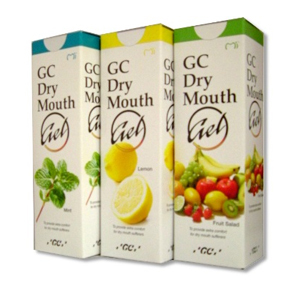 GC Dry Mouth Gel should be applied anytime during the day as needed or at night before bed after normal tooth brushing. 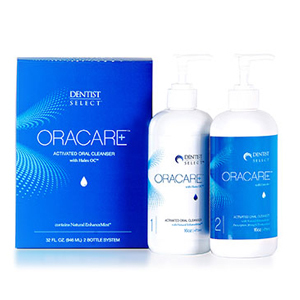 OraCare is a prescription strength mouth cleanser dispensed by dentists. It's safe for patients 8 years of age and older, vegans, and for use during pregnancy. OraCare is a two-bottle (16 ounces each) system in which stabilized chlorine dioxide is converted into active chlorine dioxide gas by a complex chemical reaction created and mediated by catalysts. When combined, the two formulas equal 32 ounces of effective product. True chlorine dioxide is one of the most powerful antimicrobials known. It does not remain dissolved in liquid so it must be mixed and released in a chemical reaction every time it's used. When OraCare's formula 1 and formula 2 are combined, the resulting chlorine dioxide gas is toxic to bacteria, viruses, and fungi. OraCare's ability to inhibit bacterial growth was tested during a study at the University of Iowa College of Dentistry. It was found to not only inhibit bacterial growth, but it killed the following bacteria: Lactobacillus acidophilus, Pseudomonas aeruginosa, Proteus mirabilis, Streptococcus mutans, Prevotella intermedia, Porphyromonas gingivalis, Treponema denticola, Tannerella forsythia, Treponema socranskii, and Aggregatibacter actinomycetemcomitans. In addition, OraCare inhibited the growth of Candida albicans. Since OraCare is such a powerful oxidizing agent, it can also help maintain a white smile after whitening procedures. 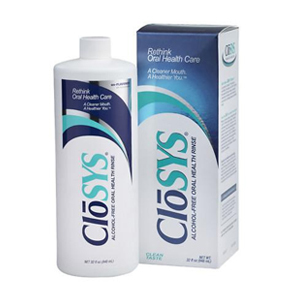 With its strong performance against the oral bacteria that causes infections of the peridontium and endodontium, as well as dental caries and staph infections, and its favorable behavior toward healing cells (fibroblasts), Cloys addresses a spectrum of clinical oral hygiene concerns. Finally, its agreeable taste and non-tooth-staining characteristics encourage patients to be fully compliant. As a non-prescription oral rinse, Cloys not only meets and may surpass CHX in post-procedure applications, it also can be recommended for twice-daily regular oral care as a maintenance and preventative measure. Cloys is now a premium standard for daily oral care. Alcohol-Free chlorhexidine gluconate oral rinse USP, 0.12% from GUM helps all your patients gain from their gingivitis treatment - without alcohol. Contains 0% alcohol vs 11.6% alcohol in other chlorhexidine rinses marketed in the U.S.
Alcohol is present in all other chlorhexidine oral rinses sold in the U.S. -- in a concentration of 11.6%! 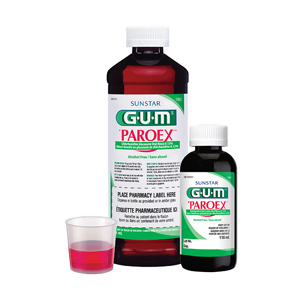 If you want to avoid alcohol, choose Paroex alcohol-free Chlorhexidine Gluconate Oral Rinse USP, 0.12% from GUM® for all patients.